DIY Customer Photos — Radiant Design & Supply, Inc. 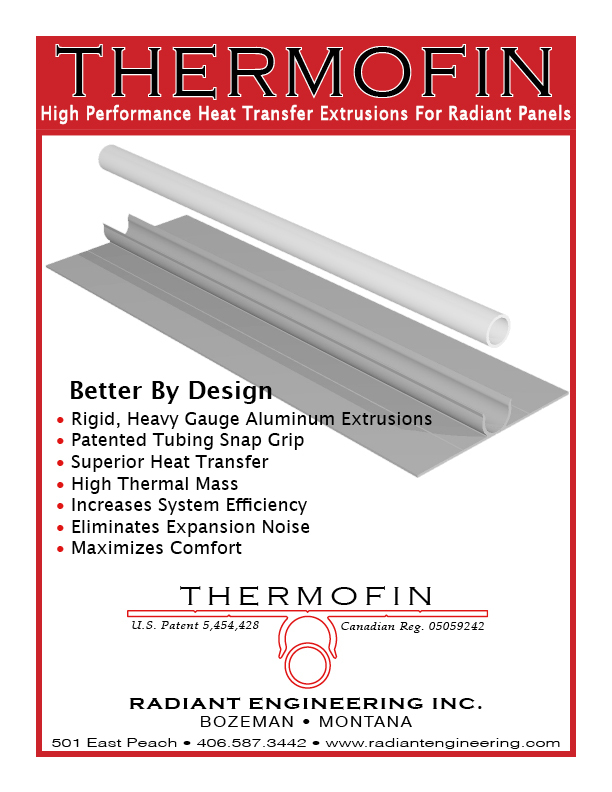 Some of Radiant Design & Supply's customers have shared photos of their projects using ThermoFin extruded aluminum heat transfer plates. If you have photos of your project that you would like to share, contact us. This DIY homeowner will install the finish flooring later in the schedule of the project. Meanwhile, life goes on warmly. These photos are from a DIY family in Montana who added a hydronic radiant heating system from Radiant Engineering. Terry Davenport goes on to say, "My system runs at 110 f and returns at 100 f. It is a 440 ft2 cottage with 3, 150 ft loops one zone, electric boiler. The hardwood pex is in between 3/4", 8" plywood. The bath tile floor is the same only with the heat transfer plates on the top of the 3/4" plywood, then 3/8" hardy tile underlayment, then tile. The floor is insulated between the joists with R21 fiberglass. The cottage has a very low heat loss. The walls are R of 40. The roof is R 90."